Here's a new remount pendant story. A client had a unique mother's ring with three marquise colored gemstones surrounded by diamonds. 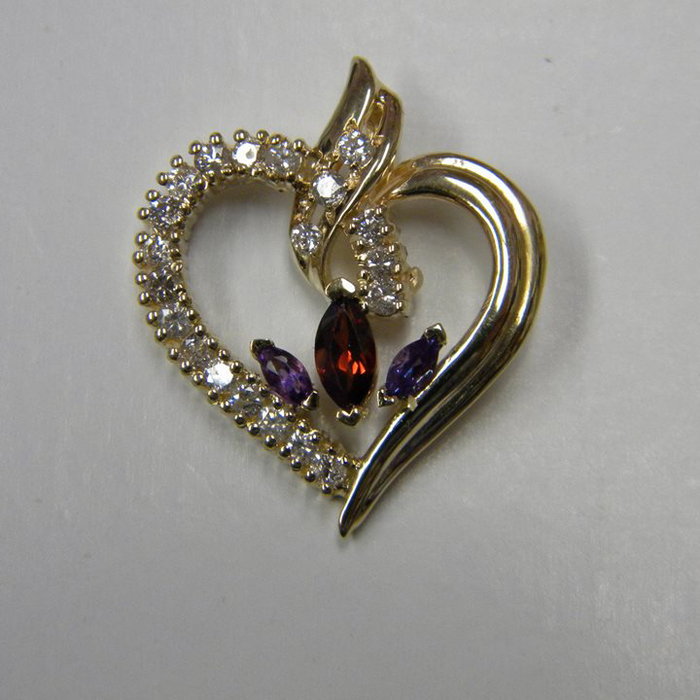 The marquise center stones were held by only two prongs each and loosened repeatedly. The small diamonds also loosened. The solution? This beautiful heart diamond pendant used all her stones and made this one of a kind mother's pendant for this lovely lady. The heart slides on an adjustable box chain allowing her to adjust to any length up to 22". I look forward to seeing this couple again but not to tighten her stones. Enjoy this new idea for celebrating MOM. Diana Jewelers of Liverpool, NY is proud to offer jewelry restyling as one of our many available services. Stop in or give us a call today, and our trained, friendly associates will help you create the jewelry item you've always dreamed about!